In accordance with the Holiday Spirit this post is all about having an environmentally friendly and green Christmas just by purchasing a set of outdoor Solar Christmas Lights to illuminate your home. Solar Christmas Lights can help you save electricity and money, and they are convenient to use because they don’t have to be plugged in and there are no wires to worry about. Solar Christmas lights use LED or Light Emitting Diode technology instead of filament bulbs, which not only saves power and creates vivid light, but also stays cooler than typical bulbs and thus eliminate danger of fire. When buying Solar Xmas lights you should be aware of charging times and lighting times. On average the outdoor solar lights will illuminate for about 7-8 hours while a few brands tout 12 to 15 hours of illumination time. Keep in mind that illumination time is affected by how fully the solar panel is recharged during the day. Also, an exceptionally cloudy, dark day will reduce the nightly illumination time. Solar Christmas lights are becoming very popular, which has led to increased availability and design choices. They are available in many different shapes such as stars, bells, hearts, snowmen, snowflakes, Santa designs, and more. 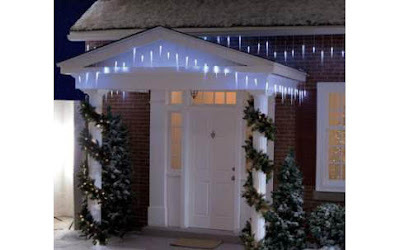 If you want to impress your friends and neighbors you may look for some really impressive solar Christmas lights - those that come with a remote control and with options that allow you to create your own light show. Some solar Christmas lights even let you change the level of light output or change the color of the lights with the remote control. So, buy a set of cool energy efficient solar Christmas lights and enjoy a Greener Christmas with your family and friends!